Creatures Great & Small, the current exhibition at World Land Trust (WLT) gallery, celebrates the diversity of the animal kingdom, with a focus on otters, which are now regularly seen in Thetford in Norfolk, not far from the gallery in Halesworth. 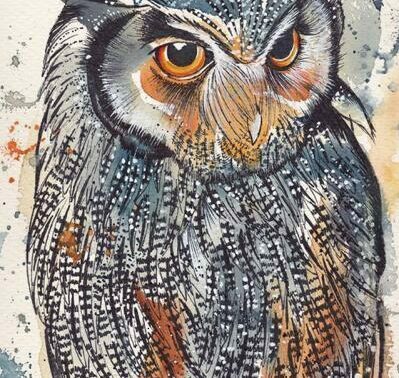 Works in the exhibition show wild creatures in locations local to the gallery as well as further afield – emphasising that there is wonderful wildlife to be seen in our own country as well as overseas. A reminder of wildlife on our doorstep was brought home by BBC’s Winterwatch, presented by Chris Packham, one of WLT’s Patrons, which has been on TV recently. The series’ central themes remain constant: watching wildlife is rewarding whatever the time of year, and wild creatures are often more fascinating – and much closer – than you think. One part of the Creatures Great & Small exhibition highlights British Otters (Lutra lutra), which are one of the greatest conservation successes of the late 20th century. 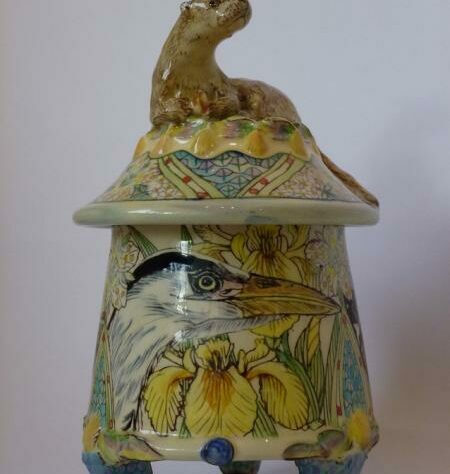 On display are Maureen Minchin’s exquisite ceramic otter pot and Martin Woodcock’s painting Otter at Thetford. Since early 2013 otters have regularly been seen along the River Ouse at Thetford in Norfolk and, to the delight of naturalists, they are frequently seen on the banks of the river right in the middle of the town. Also showing during the exhibition is James Desira’s amateur video of otters, which he made on a visit to Thetford. WLT’s Digital Communications Manager, Dan Bradbury has seen the otters several times in Thetford. According to Dan: “The Thetford otters aren’t too hard to find, because if not immediately obvious, there’s usually a large group of photographers waiting at their favourite spots or where they were last seen. The most noticeable thing about the otters is how uninterested they are in the army of followers that regularly gather on the banks of the river running through the town.” The video shows just how uninhibited the Thetford otters are. In many parts of Britain otter populations are now considered to have recovered to their natural level. This conservation comeback is all the more surprising considering that otters were nearly wiped out from lowland England in the mid 1970s due to pesticide poisoning, loss of habitat and hunting. With the approval of statutory conservation bodies, between 1984 and 1997 the Otter Trust released otters in Norfolk but there have been no reintroductions since then. Evidently, otter populations have recovered naturally, thanks to protection and the clean-up of English rivers in the past couple of decades. Conserving wild habitats and species means humans sharing the planet with creatures great and small. Inevitably this can lead to conflict between humans and wildlife, and otters are not immune from controversy. Conflict arises when otters feed on fish in garden ponds or hunt fish in Britain’s rivers. In the case of the Thetford otters, some people have called for a cull, while others have voiced their support of the otters. Last year, one of the Thetford otters was killed by an illegal fishing net, sparking fears of threats to their survival. One commentator, Oliver Sudden, has wittily articulated the otters’ point of view. According to Oliver, the otters say: “The prevalence of anglers has reached such limits that a cull may be necessary. Mild mannered otters have said that a cull might be extreme and that it might be better if the fishermen just stayed at home with their wives” (quoted on the Thetford Otters Facebook page). WLT hopes visitors to the exhibition will form their own opinion. 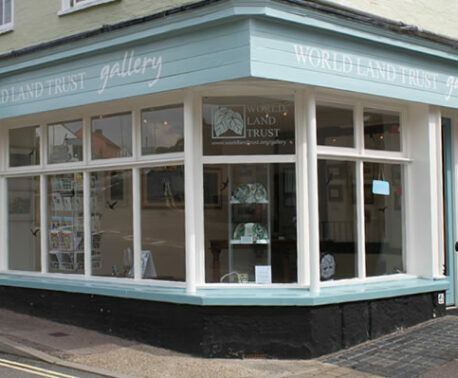 World Land Trust opened a gallery at its headquarters in Halesworth, north east Suffolk, in 2011. Specialising in wildlife and landscape art, the gallery showcases the work of local artists and those from further afield. The gallery provides a small income for the Trust’s charitable work and, through its programme of temporary exhibitions, the gallery raises awareness of wildlife and landscape conservation through the medium of art.